Legendary game developer Hideo Kojima stole the show yesterday at E3, showing off a new game titled "Death Stranding" featuring The Walking Dead star Norman Reedus. 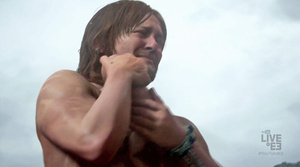 Not too much was revealed except for a short video featuring a grief-stricken Norman Reedus holding his dead child and a zoom out to a decimated landscape. The game is the first for Kojima productions since the latest MGS and the first since Kojima's highly-anticipated 'Silent Hills' game fell through following some in-fighting. We will certainly learn more soon.